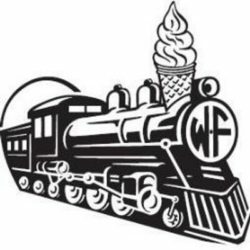 The Wake Forest Dairy Depot is an independent, locally-owned ice cream shop in Wake Forest, North Carolina featuring soft-serve cones, milkshakes, sundaes, parfaits, and our signature “Train Wrecks” (ice cream blended with a combination of your favorite novelties, candies & flavors). We also specialize in custom ice cream cakes and frozen novelties. We’d love to help you celebrate a special occasion or party. Stop by for a refreshing treat on our patio or grab some ice cream to go in our convenient drive-thru. Free Wi-Fi is available! We are directly across from Heritage Elementary and Middle Schools.